filter ran and produced output files, now what? One of the most requested features for DART has been finer control of what information is written and when. Do you want the input ensemble spread before the application of prior inflation? After prior inflation but before the assimilation? After the assimilation but before posterior inflation? After posterior inflation? etc. There are several namelist settings that control what files are output. Section 16 of the DART tutorial has a more detailed explanation. filter is called once for multiple assimilation cycles and writes a single output file containing information for all the ensemble members (single_file_out = .true.) for each stage! Depending on what you choose to write, this actually results in more than a single file. single_file_out = .false. : filter is usually called for a single assimilation cycle by 'large' models or in cases where it is beneficial to run different number of MPI tasks for the model advances and the assimilation. 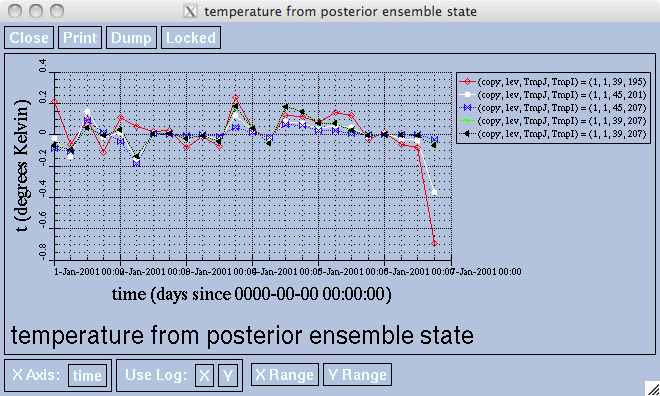 In this case, there can be a substantial computational efficiency to have each ensemble member write its information to a separate file, and each file can be written simultaneously by different tasks. The tradeoff (at the moment) is that each of the files can only have a single timestep in them. Consequently, some files are redundant and should not be output. See the section 16 of the DART tutorial for a more detailed explanation. single_file_out = .true. : When filter is used for a long assimilation experiment (as in the case for the low-order models), it is possible to consolidate all the information for a particular stage into a single file that contains all the ensemble members, the mean, spread, inflation, etc. This results in far fewer files, and each file may contain multiple timesteps to encompass the entirety of the experiment. Since a single task must write each file, there is some computational overhead. Perhaps somewhat paradoxically, single_file_out only refers to the output for a particular stage. So even if you set single_file_out = .true. , you can get several output files - one per stage. However, if you set single_file_out = .false. , be prepared for a deluge of files. Be careful about what stages you choose to write. All the information for each stage is contained in a single file that may have multiple timesteps. NOTE: the remainder of this document is written from the perspective of an experiment run with single_file_out = .true.. The permutations of the file names is just too great to write exhaustive documentation. "Were any observations successfully assimilated?". If your model can run under single_file_[in,out] Look at the ensemble mean variables. If all values are 0, then the assimilation changed nothing in the state. If your model writes multiple output files, diff the preassim_mean.nc and output_mean.nc. configure a run so filter does a single assimilation and exits, without having to advance the ensemble of models or do other work. Use the obs_sequence_tool to cut your existing obs_seq.out file down to just a few obs by selecting only a subset of the types and setting a very short time window (just a second or two where you know there are obs). Edit the input.nml and in the &filter_nml namelist set the init_time_days and init_time_seconds to match the observation time in the truncated obs_seq file. This overrides any times in the input files and ensures that filter will only assimilate and not try to advance the model. Make sure the truncated obs_seq file contains only 1 obs, a few obs at the same time, or obs close enough together in time to fit into a single assimilation window. and rerun filter to regenerate an obs_seq.final file in ascii. These diagrams help to understand an obs_seq.final file. 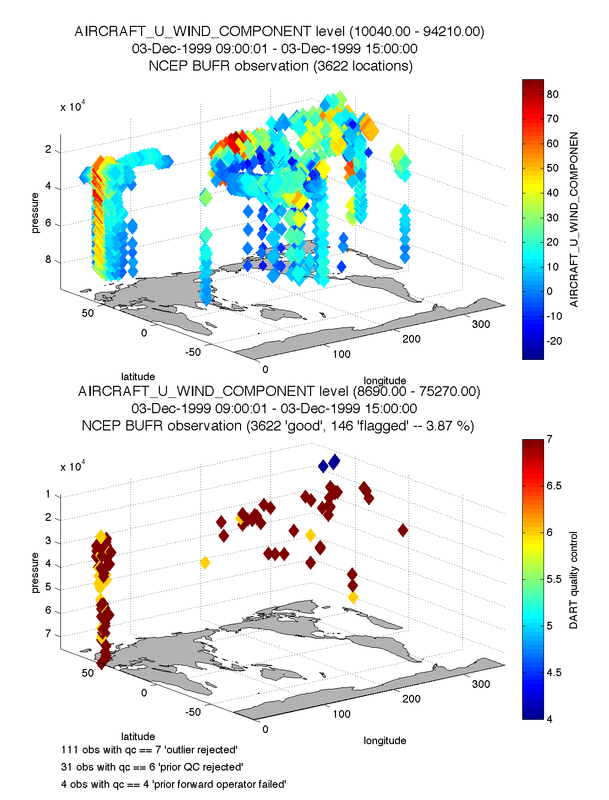 2) If you are using many observations, run the obs_diag.f90 appropriate for your model. There are some diagnostic scripts to help summarize and explore what is going on. If all the prior and posterior mean values are -888888.0 (the DART "missing data" value), those observations were not assimilated. Note: some observations have precomputed values and the posterior values for these will always be -888888.0, no matter if the observation was assimilated or not. If it is not already set, change &filter_nml num_output_obs_members to be the same as the ensemble size. This will give you all the forward operator values for all the ensemble members. You can determine if all ensemble members are failing in the same way, or if only a few are problematic. For the failing observations, the 'DART QC' may indicate the reason. ( How to locate the different values in an obs_seq.final file. The 'DART QC' field is usually the second of the 2 "quality control" copies.) A list of all the DART QC values can be found in this table. If the DART QC values are 4, the forward operators have failed. Look at the model_interpolate() routine in your model_mod.f90 file, or the forward operator code in observations/forward_operators/obs_def_xxx_mod.f90 for your observation type. A successful forward operator must return a valid obs_val and an istatus = 0. If the forward operator code returns different istatus values for different error types, you can set &filter_nml :: output_forward_op_errors = .true. and rerun filter to see exactly what error istatus codes are being set. See the filter webpage for more information on how to use the 'output_forward_op_errors' option. Negative istatus values are reserved for the system, istatus = 0 is success, and any positive value indicates a failed forward operator. The code is free to use different positive values to signal different types of errors. If the DART QC values are 5, those observation types were intentionally ignored because they were not listed in the &obs_kind_nml namelist, in the 'assimilate_these_obs_types' stringlist. If the DART QC values are 6, the data quality control that came with the original observation data indicates this is a bad quality observation and it was skipped for this reason. 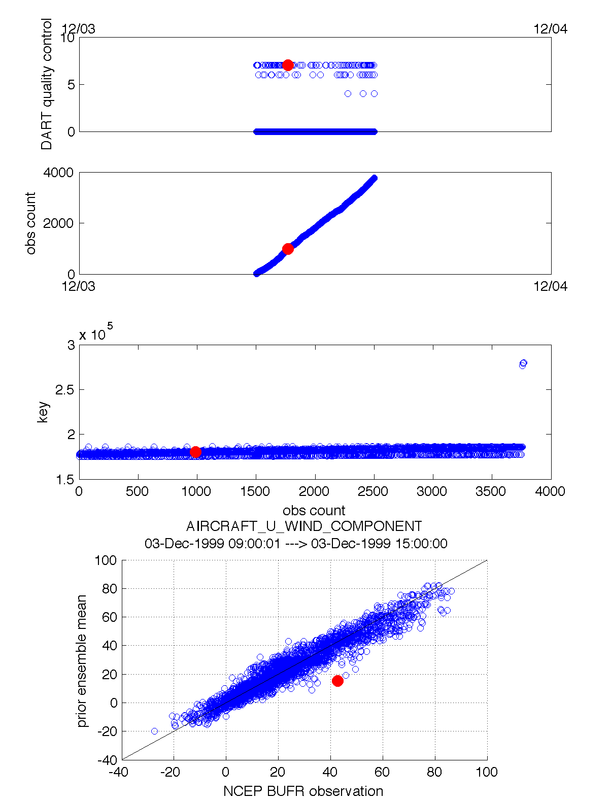 If the DART QC values are 7, the observation value is too far away from the ensemble mean. Set the &filter_nml :: outlier_threshold value to -1 to ignore this for now and rerun. In general, this is not the optimal strategy as the number of observations inconsistent with the ensemble is a very powerful indicator of the success or failure of the assimilation. If the prior and posterior values in the obs_seq.final are not -888888.0 but are identical, your obs are being assimilated but are having no impact. Your initial ensemble members must have different values for each state item. If all members have identical values, the observations cannot make a change. 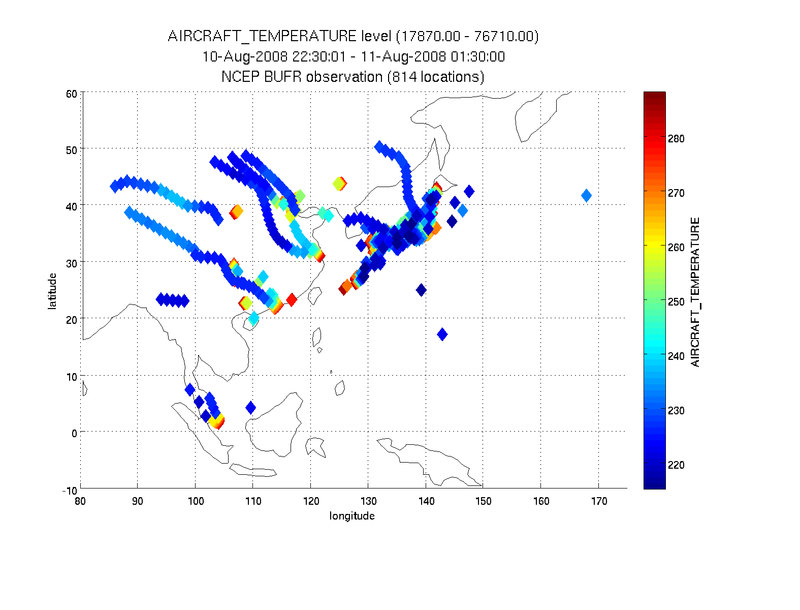 To diagnose this condition, look at the prior ensemble spread. This is either in preassim.nc or preassim_sd.nc, depending on your model. If all the values are 0, this is your problem. One way to generate an ensemble with some spread is to set &filter_nml :: perturb_from_single_instance = .false., (which will still require a single filter initial condition file) but then the filter code will add random gaussian perturbations to each state vector item to generate an initial ensemble with spread. 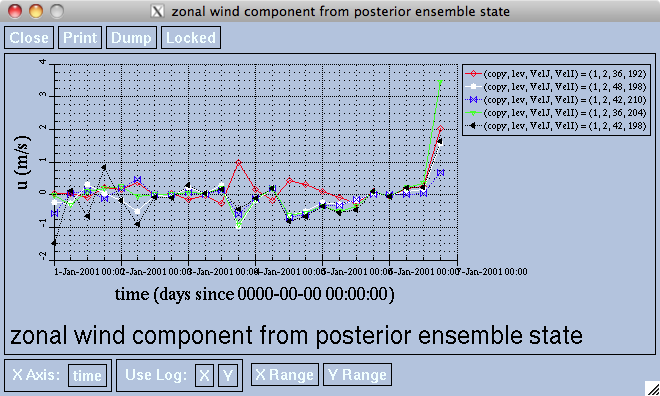 The magnitude of the gaussian noise added is controlled by the &ensemble_manager :: perturbation_amplitude. It is also possible to write your own perturbation routine in your model_mod.f90 code. If the localization radius is too small, the observation may not be 'close enough' to the model grid to be able to impact the model. Check the localization radius (&assim_tools_nml cutoff). Set it to a very large number (e.g. 100000) and rerun. If there is now an impact, the cutoff was restricting the items in the state vector so your obs had no impact before. Cutoff values are dependent on the location type being used. It is specified in radians for the threed_sphere locations module (what most large models use), or in simple distance (along a unit circle) if using a low order model (lorenz, ikeda, etc). If the observation error is very large, it will have no impact on the model state. This is less likely a cause than other possibilities. If there is no correlation between the distribution of the forward observation values and the state vector values, the increments will be very tiny. However there are generally still tiny increments applied, so this is also a low likelyhood case. If there is an error in the model_mod.f90 code in either get_state_meta_data(), model_interpolate(), or the vertical conversion code in get_close_obs(), it is possible for the forward operators to appear to be working correctly, but the distances computed for the separation between the obs and the state vector values can be incorrect. The most frequent problem is that the wrong locations are being passed back from get_state_meta_data(). This can result in the increments being applied in the wrong locations or not at all. This is usually one of the things to test carefully when developing a new model interface, and usually why we recommend starting with a single observation at a known location. If the model is using 3d coordinates and needs the capability to convert between pressure, height, and/or model level, the conversion may be incorrect. The state vector locations can appear to be too high or too low to be impacted by an observation. Some models have a height limit built into their model_mod code to avoid trying to assimilate observations at the model top. The observations cannot make meaningful changes to the model state there and trying to assimilate them can lead to problems with the inflation. If the code in the model_mod is excluding observations incorrectly, or you are testing with observations at the model top, this can result in no impact on the model state. How is the output different from the input? and you see a difference, is it correct? If you run with a single observation, you should be able to easily see the impact - generally it's a mostly spherical or circular ring around the observation location depending on your vertical localization, you may or may not see an impact in the vertical. Using &location_nml::horiz_dist_only=.true. is usually a good idea for a full 3d model to start out, and then add vertical localization once you believe the horizontal impact makes sense. Without any vertical localization, the observation should have an impact along the entire vertical column. (For lower order models this doesn't apply.) If you change the cutoff distances you should be able to watch the change in impact on the state and make sure that it's something reasonable. Now you can use the observation space diagnostics, and the state space diagnostics to get more information about what the impact was, and whether it's doing the right thing or not. If your filter run finished, and the Posterior is now different from the Prior, now what? This section presumes that you have debugged your model/DART interfaces or are using a model that came with the DART distribution. A working implementation. There is no single metric that can declare success. The DART Tutorial has the best explanation of what to look for, what to change to improve the next experiment, etc. 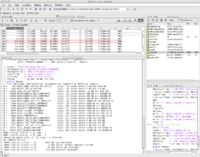 DART has an extensive set of diagnostics implemented in MATLAB®. To use them, make sure you have read the Configuring MATLAB® section. The Observations are the Key. My own (Tim's) personal view is that the first thing to check is to see how many observations are getting rejected by the assimilation in addition to the RMSE and spread of the ensemble. A natural part of the DART framework is that these metrics are calculated automatically and are readily available in the obs_seq.final files. 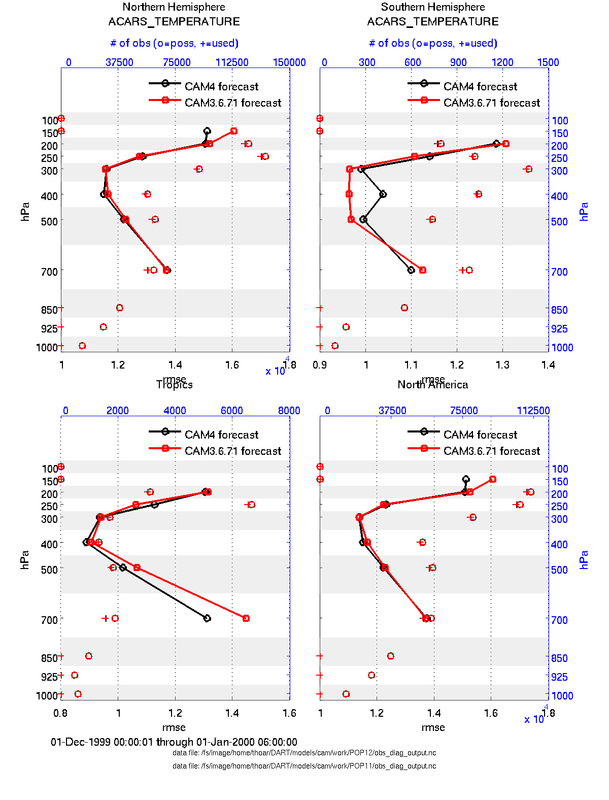 Checking the temporal evolution of the RMSE and observation rejection characteristics is a first-order metric for determining the health of the assimilation system. Use obs_diag.f90 to process the collection of obs_seq.final files for regions and times of interest. 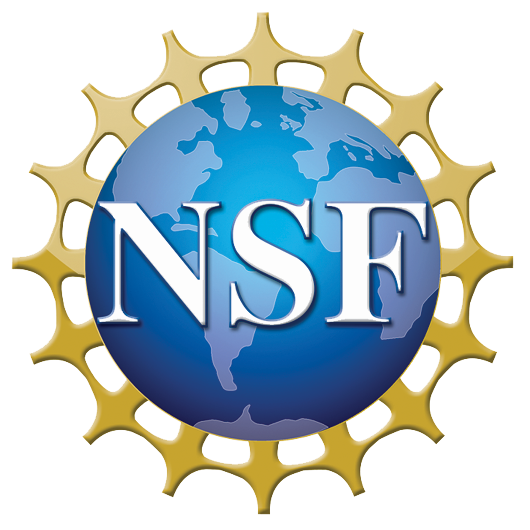 Edit the input.nml:obs_diag_nml namelist to reflect the details of your experiment, and then run obs_diag to create a netCDF file obs_diag_output.nc that contains the summaries. Make sure the spread of the ensemble does not collapse. Use plot_evolution.m with copystring = 'spread'; to explore obs_diag_output.nc. It is normal (and desirable!) for the spread to decrease somewhat from the initial value, but it should not decrease to a small value. Insufficient spread leads to filter divergence and a large observation rejection rate. plot_evolution.m automatically plots the number of observations available and the number of observations successfully assimilated. Make sure the RMSE of the ensemble does not collapse. Use plot_evolution.m with copystring = 'rmse'; to explore obs_diag_output.nc. 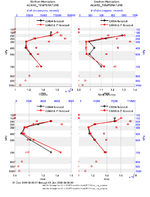 It is important to interpret the RMSE in light of the number of observations successfully assimilated. It is possible to have a very low RMSE if the assimilation system rejects all of the observations that are in disagreement! A low RMSE is desirable and is a much stronger result if most/all of the observations are being assimilated successfully. Also - the RMSE of the prior is a much stronger result. Any method can overfit the observations (match them perfectly) - what is important is that the forecast is a good forecast! 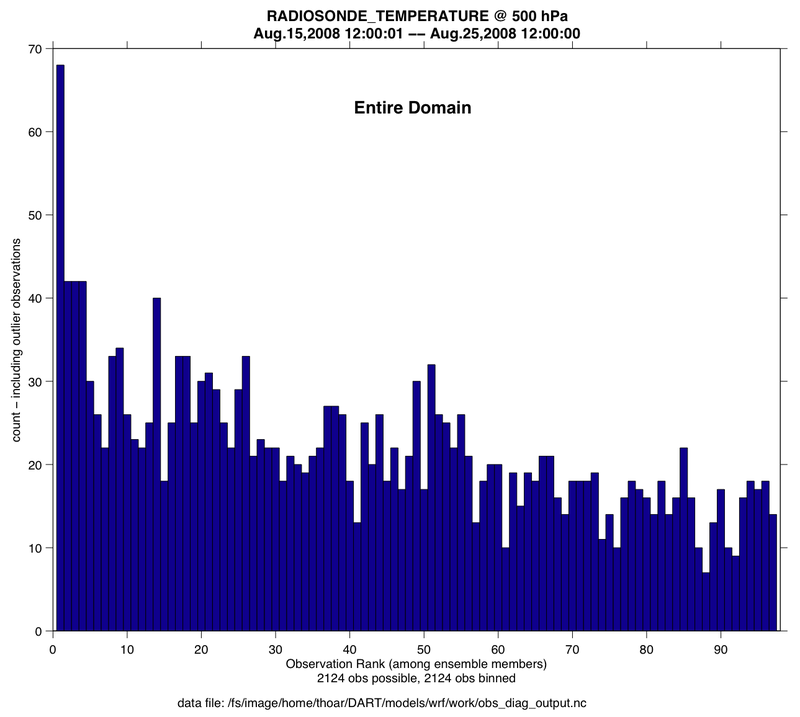 Make sure the RMSE of the ensemble does not continually increase. plot_evolution.m with copystring = 'rmse'; to explore obs_diag_output.nc. 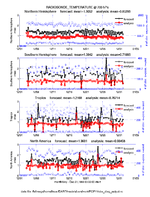 It is natural for the RMSE to vary in time in response to the changing number and location of the observations, the phenomenon being modeled, etc. ... but it should not generally increase as the system evolves. Once the system has 'burned in', the RMSE should be relatively stable. Generally speaking, the observation-space diagnostics provide the first and best metrics for the assimilation system. We always have observations, we rarely have the 'truth' in a full state-space representation. Personally, I rarely see value when comparing to some other gridded product - as it surely has its own set of deficiencies or assumptions. Observations aren't perfect - but they are still best. 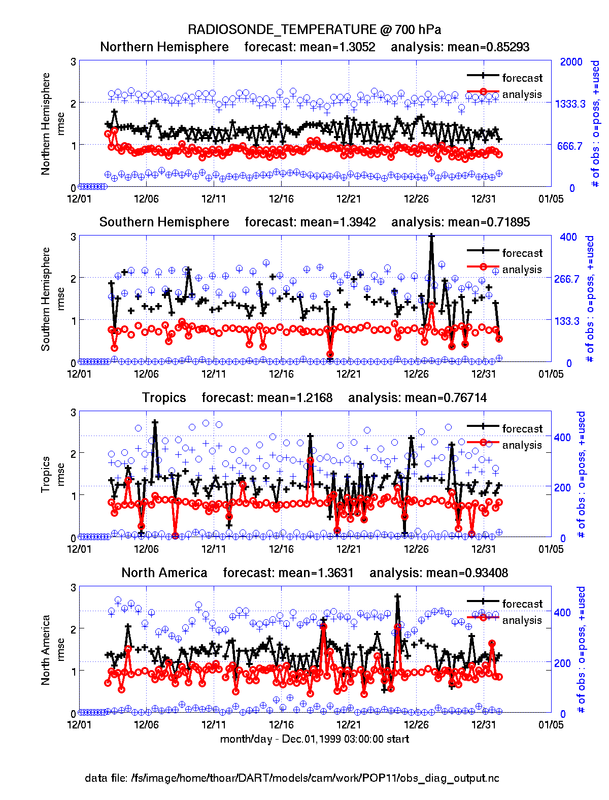 If you're reading this, it means you have an assimilation that is not rejecting too many observations, the ensemble spread is relatively constant and is not too small, and presumably the RMSE is stable if not decreasing. Now it is time to assess the affect the assimilation has on your model - the whole point of data assimilation. DART produces (sometimes many) netCDF files: preassim.nc and analysis.nc. Your files many have slightly different names depending on the namelist settings you have chosen. You should get familiar with what is available in the files you have created. Please read the documentation for &filter_nml, especially for the variables: stages_to_write, output_members, output_mean, output_sd, and single_file_out. You should experiment and become familiar with ALL the namelist variables controlling what gets written. The ability to explore the ensemble at various parts of the assimilation process and/or restrict the volume of data being written has been on of our most-requested enhancements. ncview Innov.nc ncview is another 'third-party' tool. See the expanded section on DART state-space diagnostics for more. The DART QC table is an important piece of information. 0,1 == both Prior and Posterior are good. 1 Evaluated O.K., not assimilated because namelist specified evaluate only. 2,3 == Prior OK, but Posterior failed. 2 Assimilated O.K. BUT posterior forward operator failed. 3 Evaluated O.K. BUT posterior forward operator failed. 4 Prior forward operator failed. 5 Not used because of namelist control. 6 Rejected because of incoming data QC higher than namelist control. 7 Rejected because of outlier threshold test. 8 and above reserved for future use. It is required to post-process the obs_seq.final file(s) with obs_diag to generate a netCDF file containing accumulated diagnostics for specified regions, etc. Since the experiment information (assimilation interval, assimilating model, etc.) are not recorded in the obs_seq.final file, the obs_diag_nml namelist has a section that allows specification of the necessary quantities. 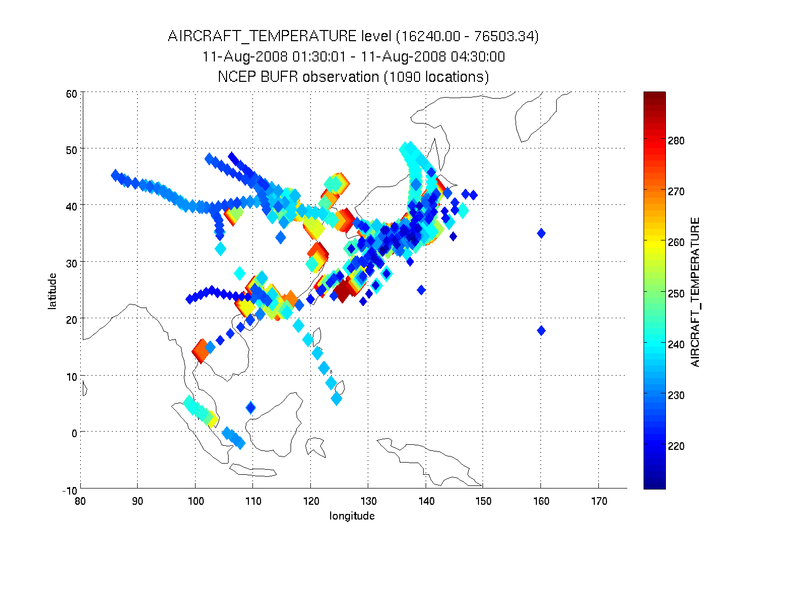 totalspread pooled spread of the observation (knowing its observational error) and the ensemble. plot_evolution.m plots the temporal evolution of any of the quantities above for each variable for specified levels. The number of observations possible and used are plotted on the same axis. plot_profile.m plots the spatial and temporal average of any specified quantity as a function of height. The number of observations possible and used are plotted on the same axis. plot_rmse_xxx_evolution.m same as plot_evolution.m but will overlay rmse on the same axis. plot_rmse_xxx_profile.m same as plot_profile.m with an overlay of rmse. plot_bias_xxx_profile.m same as plot_profile.m with an overlay of bias. two_experiments_evolution.m same as plot_evolution.m but will overlay multiple (more than two, actually) experiments (i.e. multiple obs_diag_output.nc files) on the same axis. A separate figure is created for each region in the obs_diag_output.nc file. two_experiments_profile.m same as plot_profile.m but will overlay multiple (more than two, actually) experiments (i.e. multiple obs_diag_output.nc files) on the same axis. 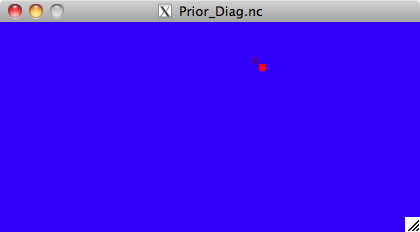 If the obs_diag_output.nc file was created with multiple regions, there are multiple axes on a single figure. plot_rank_histogram.m will create rank histograms for any variable that has that information present in obs_diag_output.nc. You may also convert observation sequence files to netCDF by using obs_seq_to_netcdf. All of the following routines will work on observation sequences files AFTER an assimilation (i.e. obs_seq.final files that have been converted to netCDF), and some of them will work on obs_seq.out-type files that have been converted. read_obs_netcdf.m reads a particular variable and copy from a netCDF-format observation sequence file and returns a single structure with useful bits for plotting/exploring. This routine is the back-end for plot_obs_netcdf . 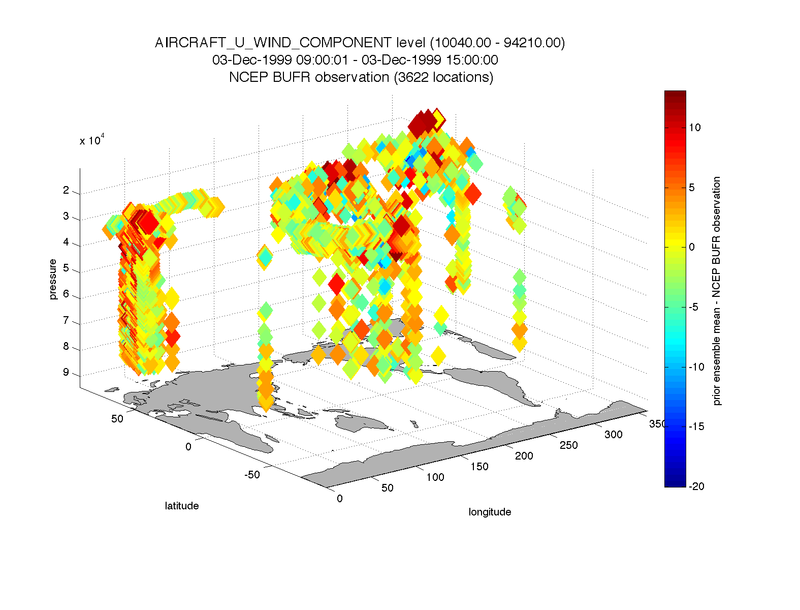 plot_obs_netcdf.m creates a 3D scatterplot of the observation locations, color-coded to the observation values. A second axis will also plot the QC values if desired. 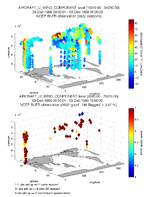 plot_obs_netcdf_diffs.m creates a 3D scatterplot of the difference between two 'copies' of an observation. 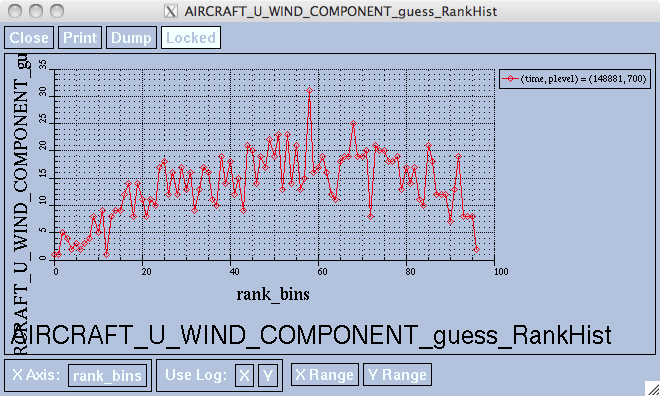 plot_wind_vectors.m creates a 2D 'quiver' plot of a wind field. This function is in the matlab/private directory - but if you want to use it, you can move it out. I find it has very little practical value. 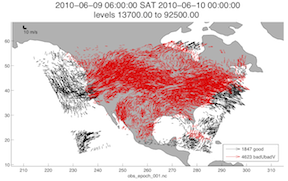 ObsTimeCheck.m is an example of a trivial little script to wrap around plot_obs_netcdf.m that allows you to explore the spatial distribution of your observation sequences. Since obs_seq_to_netcdf doesn't know anything about assimilation windows; the idea is to create separate netCDF files for each assimilation window and then explore a sequence of windows. Since ObsTimeCheck.m is in the subversion repository, you should feel free to edit it/modify it to your heart's desire. 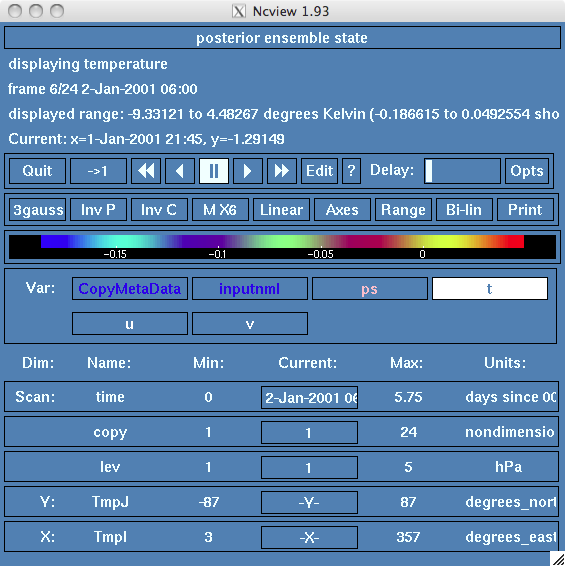 If there are no observations of that type in a particular assimilation window, the MATLAB® Command window will have a comment to that effect. After you create obs_diag_output.nc with obs_diag it is important to understand what is contained in obs_diag_output.nc. Remember, this is just a dump of the header of the file! There are many more variables in this particular netCDF file - indicated by the '...' (the ellipsis). What is really important to note is that each observation variable has a copy dimension - and each copy description is contained in the CopyMetaData variable. A dump of that variable provides information about what quantities are directly available. In the above example, the rmse is copy 7. You should never assume this information, you should always check the CopyMetaData variable to find the appropriate copy index. 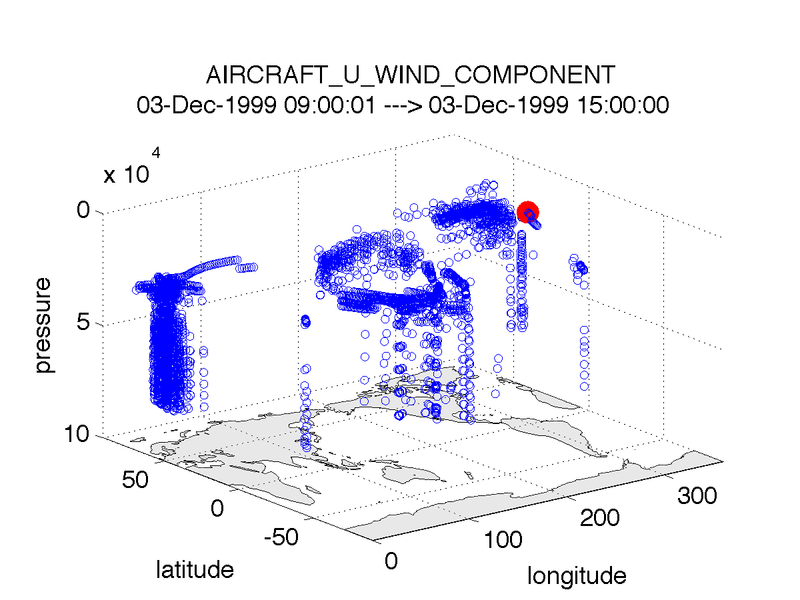 Let's look at the RADIOSONDE_U_WIND_COMPONENT_guess variable in the example. It has 4 dimensions: [time, copy, plevel, region]. Since 'plevel' is one of the dimensions, the appropriate levels are defined by the coordinate variable of the same name. The RADIOSONDE_U_WIND_COMPONENT_VPguess variable has 3 dimensions: [copy, plevel, region]. The 'time' dimension has been averaged out such that a single Vertical Profile (VP) is defined for the entire timeframe specified in the namelist. If I were a better man, I'd put the averaging interval in the variable metadata to have a hope of complying with convention; instead, it is only in the global metadata for the entire netCDF file as first_bin_center, last_bin_center, and time_to_skip. Add the time_to_skip to the first_bin_center to derive the start of the averaging period. This allows one to ignore the effects of spinup. 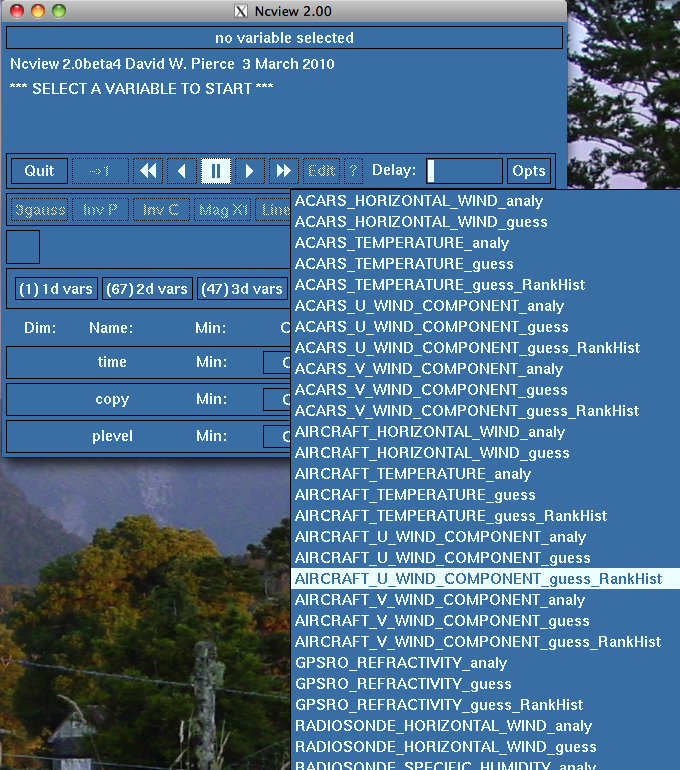 The RADIOSONDE_U_WIND_COMPONENT_guess_RankHi variable name has been cut short by the netCDF restriction that variable names can only contain 40 characters. The _RankHist variables are only present if the input obs_seq.final files have multiple ensemble members present. 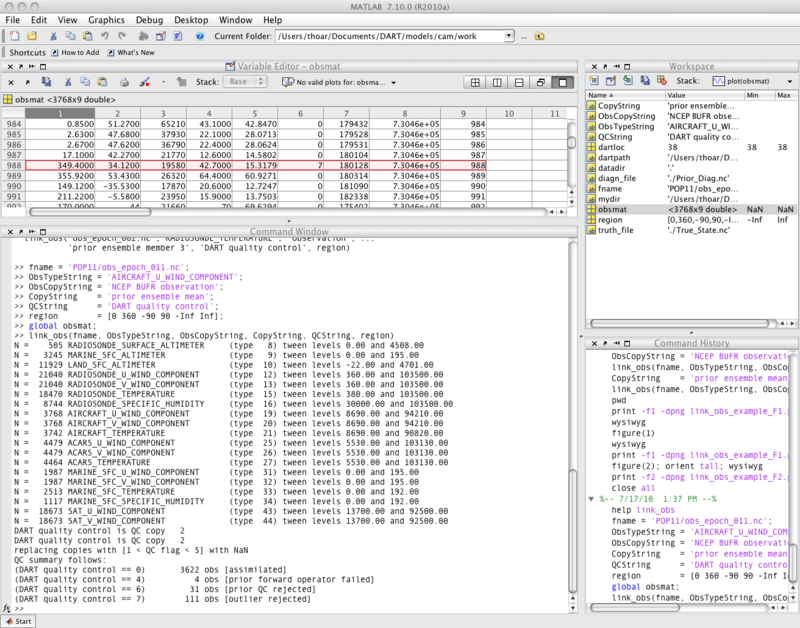 You cannot derive this information unless the assimilation was performed with filter_nml:num_output_obs_members equal to something like the ensemble size. Navigate to the time of interest (these are the arrows next to the QUIT button.) 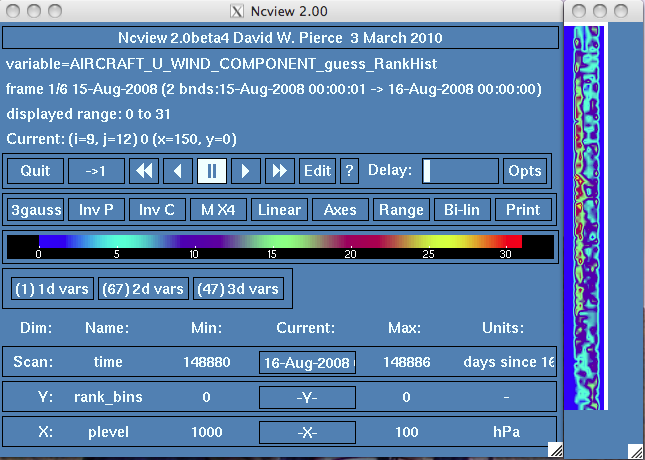 If ncview was built with udunits support, the actual calendar dates and times should be shown next to the frame counter. That should generate something like the graphic on the right below. Since the default axes are (Y == histogram_bins, X == levels) and there are many more ensemble members (96) than vertical levels (20) in this netCDF file, the graphic appears tall and narrow. Change the "X Axis:" to "rank_bins" and a new graphic will display the rank histogram. If you continue to click on the "tall,skinny" graphic, the histogram for that level will be added to the rank histogram window. Remember, levels are along the X axis on the "tall,skinny" graphic. Viola'! DART state-space diagnostics - low-order models. The High-order model state-space diagnostics descriptions are under construction. There are a set of MATLAB® functions to help explore the assimilation performance in state-space, which is very useful for OSSE's (i.e. when you know the true model state). The general guideline here is that anything that computes an 'error' requires the truth. There are some functions that work without a true state. In order to use any of these functions, the scripts need to know how to interpret the layout of the netCDF file - which is usually model-dependent. See the section on Adding MATLAB® support for your own model if you are not using one of the supported DART models. The state-space functions are in the DART/diagnostics/matlab directory. They all have the expected 'help' file accessible by simply typing help [function_of_interest] at the Matlab prompt. plot_total_err.m plots the evolution of the error (un-normalized) and ensemble spread of all state variables. plot_bins.m plots the rank histograms for a set of state variables. 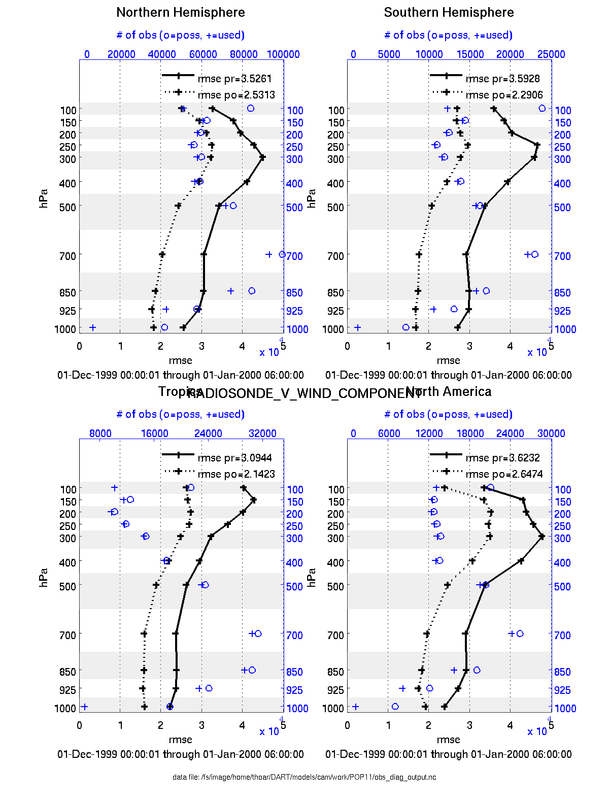 plot_ens_time_series.m plots the evolution of a set of state variables - all ensemble members, the ensemble mean (and Truth, if available). plot_ens_mean_time_series.m plots the evolution of a set of state variables - just the ensemble mean (and Truth, if available). plot_ens_err_spread.m plots the evolution of the ensemble error and spread for a select set of state variables. plot_correl.m plots the correlation through time of a state variable and the rest of the state. 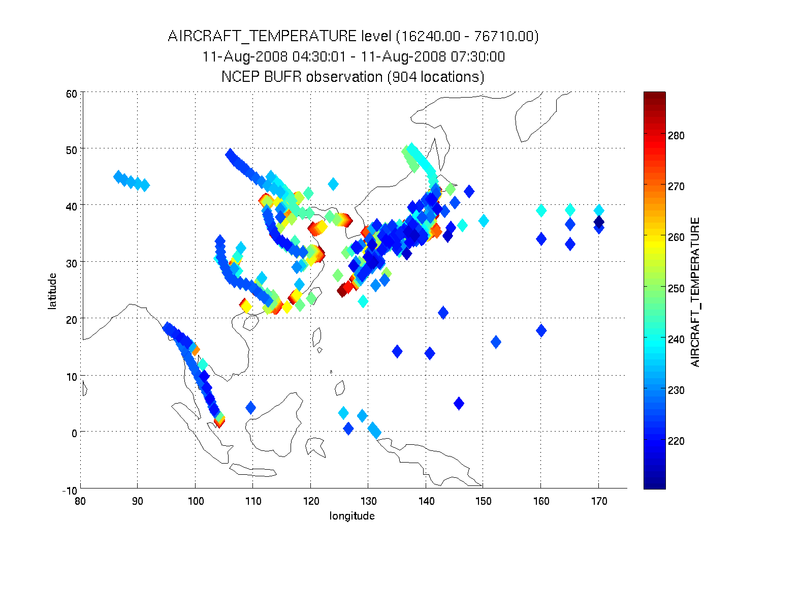 plot_var_var_correl.m plots the correlation between two variables at a particular location. plot_jeff_correl.m plots the correlation through time of a state variable at a particular time and any state variable. plot_sawtooth.m plots the trajectory of any set of state variables highlighting the assimilation 'increment'. 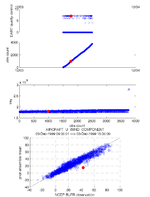 plot_phase_space.m plots the trajectory of any two or three state variables. The classic attractor diagram. plot_smoother_err.m plots the error of the ensemble smoother - which uses observations in the future as well as the present. If the assimilation used state-space inflation, the inflation fields will be added as additional 'copies'. A sure sign of trouble is if the inflation fields grow without bound. As the observation network changes, expect the inflation values to change. The only other thing I look for in state-space is that the increments are 'reasonable'. As the assimilation 'burns in', the increments are generally larger than increments from an assimilation that has been cycling for a long time. If the increments keep getting bigger, the ensemble is continually drifting away from the observation. Not good. In ncview, it is useful to navigate to the copy/level of interest and re-range the data to values appropriate to the current data and then hit the '>>' button to animate the image. It should be possible to get a sense of the magnitude of the innovations as a function of time. Example from a model of intermediate complexity: the bgrid model. I ran a perfect model experiment with the bgrid model in the DART-default configuration and turned on some adaptive inflation for this example. To fully demonstrate the adaptive inflation, it is useful to have an observation network that changes through time. 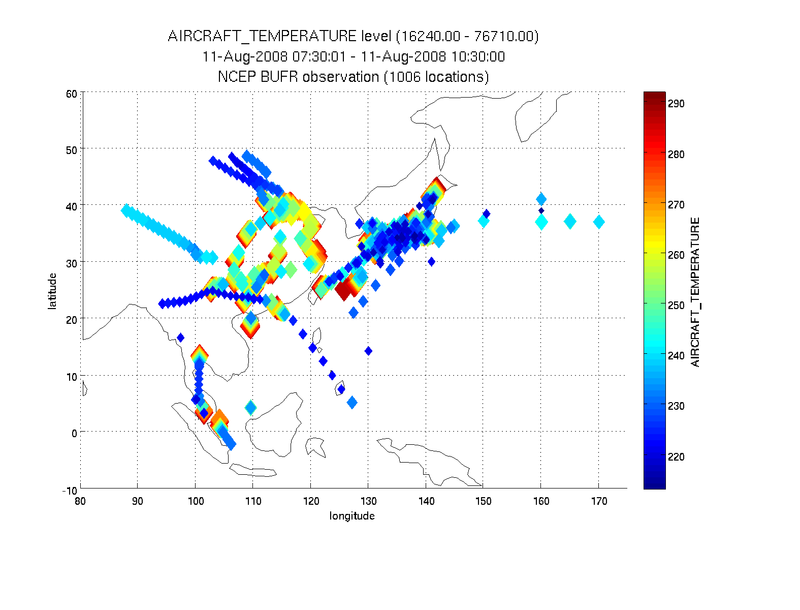 I created two observation sequence files: one that had a single 'RADIOSONDE_TEMPERATURE' observation at the surface with an observation error variance of 1.5 degrees Kelvin - repeated every 6 hours for 6 days (24 timesteps); and one that had 9 observations locations clustered in about the same location that repeated every 6 hours for 1.5 days (6 timesteps). I merged the two observation sequences into one using obs_sequence_tool and ran them through perfect_model_obs to derive the observation values and create an obs_seq.out file to run through filter. NOTE: Other models may have their ensemble means and spreads and inflation values in separate files. See the table of possible filenames. 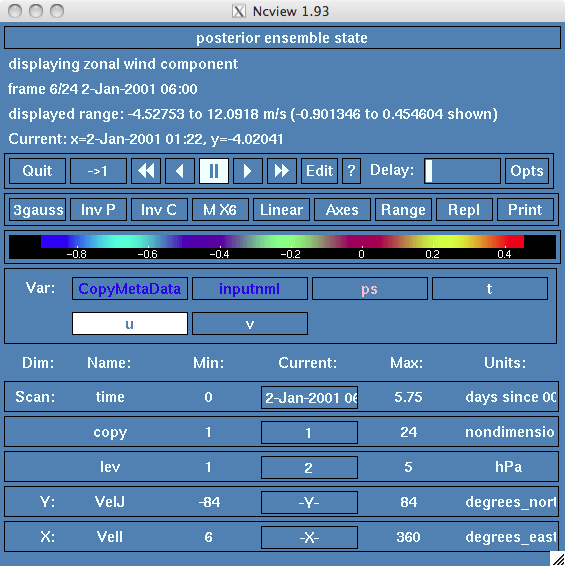 double ps_mean(time, TmpJ, TmpI) ;        The ensemble mean   is now a separate variable. 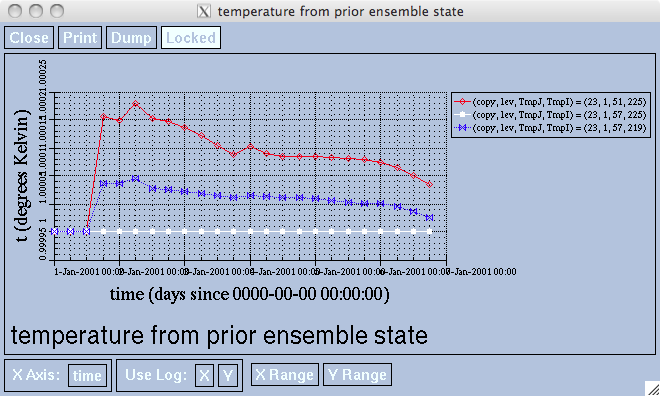 double t_mean(time, lev, TmpJ, TmpI) ;    The ensemble spread is now a separate variable. double u_mean(time, lev, VelJ, VelI) ;    If I was using inflation, they would also be separate variables. This is an exploration of the preassim.nc file. Note that I selected the 't' field, turned the coastlines 'off' under the 'Opts' button, used the 'Repl' instead of 'Bi-lin' (to more faithfully represent the model resolution), navigated to copy 23 of 24 (in this case, the inflation mean) select the inflation mean variable of your choice and advanced to the last timestep. The image plot is pretty boring, but does indicate that the inflation values are restricted to where I put the observations. Right-clicking on the 'Range' button automatically re-ranges the colorbar to the min/max of the current data. 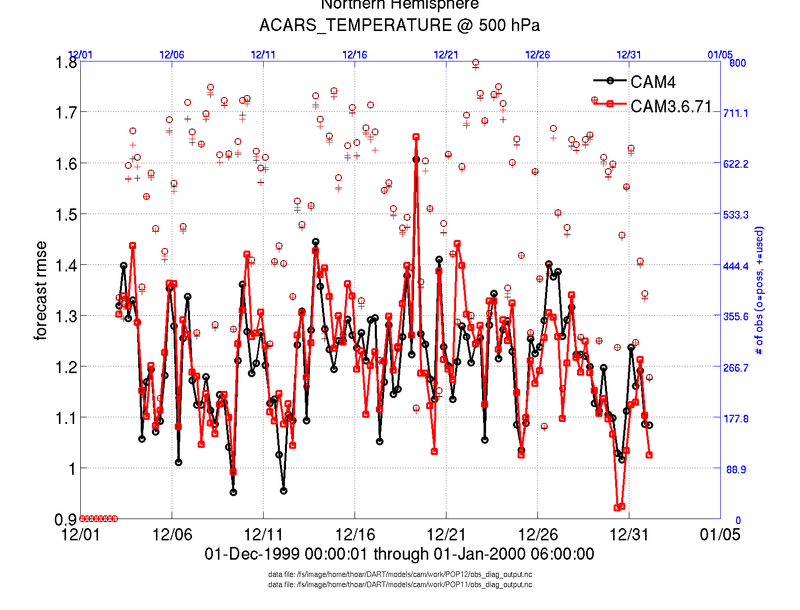 Clicking on any location generates a time series figure. 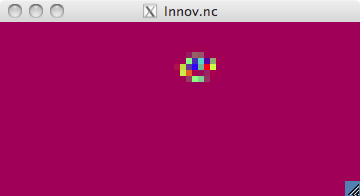 This is an exploration of the Innov.nc file as created by ncdiff. Note that the titles are somewhat misleading because they reflect information from the first file given to ncdiff. This time I left the rendering as 'Bi-lin' (which obfuscates the model resolution), navigated to copy 1 of 24 (in this case, the ensemble mean) selected the t_mean variable and advanced to the 6th timestep. Right-click on the 'Range' button to reset the colorbar. 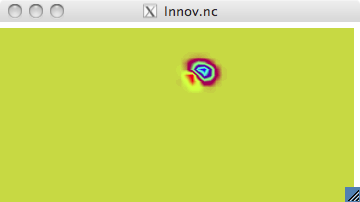 The image plot confirms that the innovations are restricted to a local region. 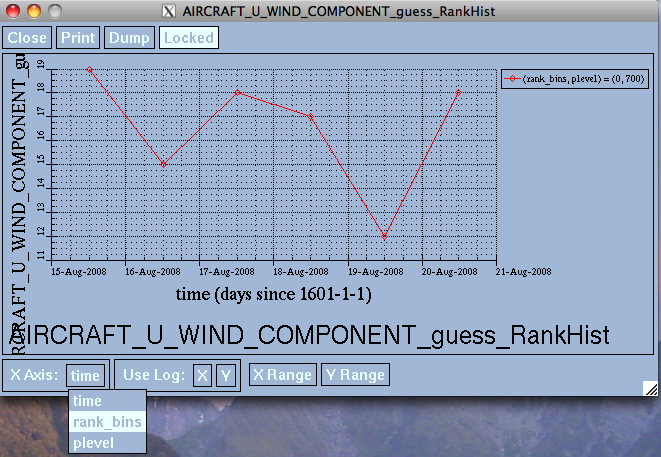 Clicking on any location generates a time series. This is fundamentally the same as the previous panel except that I have now selected the 'u' u_mean variable. Despite the fact the observations were only of 't', the assimilation has generated (rightly so) increments to the 'u' state variable.